A typhoon sweeps across southern Taiwan, causing landslides that devastate a mountain community. A-Ying (Wu Yi-Ting), the owner of a local hot spring, steps out into the storm and is never seen again. His widow Mei-Cho (Lu Yi-Ching) is left to pick up the pieces, while a property developer starts pressuring the surviving residents to sell their properties for a five-star resort. 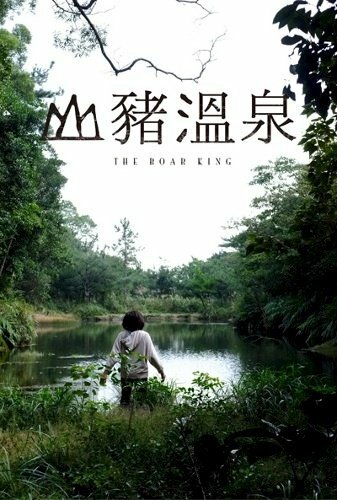 The Boar King is an independent Taiwanese drama directed by documentary filmmaker Kuo Chen-Ti. The film employs a deliberately slow and gentle pace, as it showcases and explores the grief process through the eyes of Mei-Cho, her step-daughter A-Fen (Wu I-Ting) and the close family friend Jheng-Nang (Tsai Chen-Nan). The film has a profound sense of place. It was shot on location in southern Taiwan, where a 2009 typhoon caused extensive devastation including the deaths of more than 600 people. One landslide alone buried an entire village, killing 400. Producing a dramatic film that echoes and references such deep human tragedy is a difficult task, and it is to the film’s credit that Kuo adopts such a respectful and delicate touch. Even after a stretch of a few years, the damage to the infrastructure and the natural landscape is clearly visible. Lu Yi-Ching gives a carefully observed and wisely under-played performance as Mei-Cho. She recognises that grief may involve immediate out-pourings of tears, but as the weeks stretch on it also involves introspection, guilt, loneliness, and even random outbursts of near-hysterical amusement. The human mind is a complex thing, and the film frees Lu to express all of the facets of loss over the course of the narrative. The sheer scale of the challenge facing Mei-Cho is dizzying: not only is she forced to cope with the open-ended loss of her husband – his body is never found – but the hot springs from which they draw their livelihood has been severely damaged, other local residents around them are packing up and leaving, and a predatory property developer is working hard to convince her to simply sell up and move to the city. Wu I-Ting makes what appears to be her feature debut here as Mei-Cho’s step-daughter A-Fen, who is dealing with the loss of her father on her own terms. She has a distinctly different sort of reaction, one punctuated by much sharper and harder outpourings of grief. In one beautifully performed scene, she arrives home late one night to find Mei-Cho asleep in front of a home video taken by A-Ying before he died. When she sees his face on screen she bursts into tears, but silently so as not to wake her step-mother. It is a raw and wounded scene, and hugely effective. At other times A-Fen finds herself romantically pursued by Taiwan’s most ill-timed and awkward suitor, which helps to bring a small amount of levity to what could be an overwhelmingly melancholy film. A-Ying’s home videos are worth touching upon: before he vanishes into the storm he obsessively records the lives of those around him. As the film progresses, it becomes clear he was documenting them ever more than they had realised. The recurring flashbacks to these videos, presented in a small 4:3 ratio compared to the film’s more expansive framing, give A-Ying an ongoing presence throughout. They also contrast sharply with the black and white presentation of the bulk of the film. A happy past is colourful, and a mournful present is monochromatic. It is only when live begins to move on, and Mei-Cho begins to look forwards that colour returns to the film more generally. It is a simple but effective technique, and certainly the mountains, valleys and forests of southern Taiwan look remarkably dramatic in black and white. Bodo Zeng’s cinematography is tremendous, with a brilliant sense for strong imagery. There are other characters to the film. Lin Bing-Huan makes a delightful impression as A-Ying’s elderly father Suen-Yong while Tsai Chen-Nan is rock-solid as long-time family friend Jheng-Nang, who spends his time scavenging traditional herbs from the forest. He also hunts wild boar, and his relating of catching the titular ‘boar king’ to Mei-Cho forms a superbly restrained scene later in the film. Some viewers will likely chafe at The Boar King‘s leisurely pace, and relatively slight and open-ended story. For me both elements are necessary for the effect Kuo Chen-Ti is attempting to achieve. It is a delicate and perfectly observed presentation of grief – and the slow acceptance that lies beyond it.